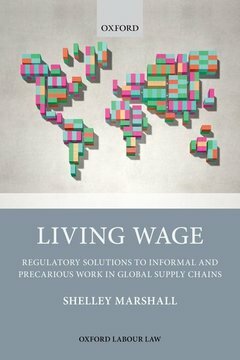 This book is driven by a quest to re-regulate work to reduce informality and inequality, and promote a living wage for more people across the world. It presents the findings of a multidisciplinary study in four countries of varying wealth and development, exploring why people become trapped in precarious work. The accounts describe the impact of supply chain governance, trade agreements, internal and between-country migration, legal factors, as well as the socio-economic characteristics and outlooks of the workers. In a unique approach, the chapters describe existing labour regulation measures that have succeeded, but which have to date attracted little scholarly attention. Building on these existing innovations, the book proposes a new international labour law which would incrementally increase the wages of the poor and regulate precarious work in global supply chains. Shelley Marshall is a cross-disciplinary scholar whose research spans corporate accountability, corporate governance, labour law, and development. She has undertaken empirical studies in Thailand, Bulgaria, India, Indonesia, Australia, and Cambodia and has published widely based on her findings in these countries. Shelley has led a number of large, multi-country studies. Her long-term partnerships with the International Labour Organization, Oxfam Australia, and CORE UK have led to research which has had a strong influence on policy and provided useful guidance for governments, international organisations, NGOs, and unions. She has provided advice to a number of governments about how to reform and apply labour laws for the betterment of informal workers.